We started Monday off with Chiquita visits. After breakfast two representatives from Chiquita escorted the group to Guacimo, where Chiquita’s research facility is located. There we were greeted by Christian and Elizabeth, our tour guides for the day. At the research facility they focus on the crops that Chiquita grows, mainly bananas of course. 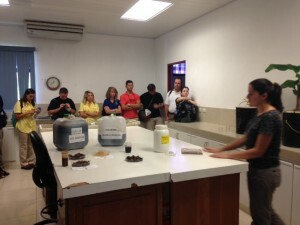 We saw how Chiquita propagates the bananas in order to perform research and experiments on them. Almost all of the bananas we eat are of the cavendish variety, so they are all cloned of each other. We went into a room where small banana plants were growing in miniature containers, and there were tens of thousands of plants in there. They had them stacked in pyramids, so some of the plants did not have access to light. However using the special containers and certain techniques the bananas could maintain their growth and stay alive without direct light. Other parts of the research facility we saw included the IPM division and post harvest division. IPM stands for Integrated Pest Management and uses biological, chemical, and mechanical practices to eliminate pests. A combination of IPM practices are crucial to prevent harm to the environment. For example if a farmer used only pesticides on their land, all of the chemicals could pollute the water or harm the land. Or if a farmer used only biological controls it could disturb the food chain and biological communities. Having variety is very important, however it is often difficult to find ways to to incorporate biological controls. This is what they were focusing on in the lab, and were using natural predators to help control the mealy bug population. The post harvest division faces many challenges as well. We learnt that if one hand of bananas was already ripe in the shipping container, the buyer will not pay for the entire container. This could be a huge loss of profit for the company, so it is critical to have the ripening times down to a science. Here we also got to eat some Chiquita bananas. We had a spur of the moment wildlife encounter while waiting to board the bus at the research station, when we saw a sloth resting in a tree in the parking lot! Fun fact: sloths come down every 30 days to the forest floor to defecate. After taking pictures of the sloth we got on our bus and headed to the farms. We had to take a short drive through a city and then about a twenty minute ride down a dirt road to the farm. The first thing you see when you get to the farm is a banana train. This is how bananas get from the fields, to where they are packaged. Basically the bananas are lined up on this track and workers pull the bananas along the tracks. We had the chance to go out into the fields, and we went pretty deep. It was very muddy, but thankfully we had boots. There we had a demonstration of how they bag the bananas to keep pests out. We also learnt more about how the trees themselves grow. There is a lot of work that goes into creating the bananas that we eat, it was almost mind blowing. 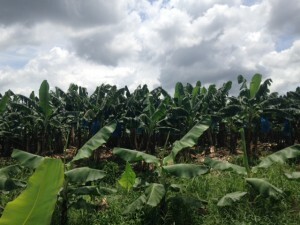 After we left the banana fields, had lunch, and changed into more comfortable clothes we began our three hour bus trek. It began to rain, and we had to go around some steep mountains with narrow roads. All while passing semi-trucks. Thankfully our bus driver, Abraham, knew how to keep us safe. We arrived at our hotel, Termales Del Bosque, and had dinner. There we’re several interesting things about this hotel. For one, we stayed in bungalows and they were beautiful! Each one was like a little house and very unique. The other unique part of the hotel was the hot springs. There were natural hot springs that guests can go and enjoy. A short hike down a wooded path put us at about half a dozen hot springs containing natural water. The higher up the mountain you went, the hotter the springs. The hottest one was forty eight degrees celsius. There was also a river right next to the springs that you can get in, and a little swimming hole. It was very refreshing to get in the freezing cold river, and then hop right into warm springs. Relaxing in the hot springs was a perfect way to relax and end our fifth day in Costa Rica. 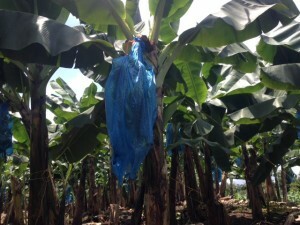 • Uganda Starts Trials on Banana Bacterial Wilt Resistant Varieties Created With Genetic Engineering.